We are showing a total of 31 discount Fulcrum MTB Wheels wheels, with an average saving of 18% across the range. 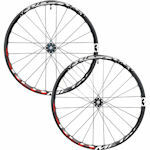 There are savings ranging from £20.40 for the Fulcrum RM3-11DFB Red Metal 3 QR/HH15 Disc 6-bolt front wheel 2011 at Cyclestore, up to £212.00 off for the Fulcrum Red Power 27.5 HP Centre Lock MTB Wheel Sets available at Wiggle for £87.99 and the same percentage saving for the Fulcrum Red Passion Tubeless AFS 29' Wheelset Black/Red - Aluminium - Shimano from Evans Cycles at a sale price of £759.99. This level of discount is also available at the following cycle shops: Chain Reaction Cycles, Cyclestore, Evans Cycles, Probikekit.com, Wiggle, for example giving a saving of £73.2 off the Fulcrum Red Zone 7 TR Boost MTB Wheelset 2019 at Chain Reaction Cycles for a sale price of £186.79. We've found discounts on 22 wheels and wheelsets for this model, with the price for the Fulcrum Red Power 27.5 HP Centre Lock MTB Wheel Sets giving the largest reduction at 70% off, available from Wiggle and saving £212.00. The saving of around £212.00 is available at more than one retailer. and the top percentage discount is also for this model at Wiggle. This level of discount is also available at the following cycle shops: Wiggle, for example also giving a saving of £73.2 off the Fulcrum Red Zone 7 27.5 Disc Brake Wheelset - Shimano - HH15 AFS Boost at Probikekit.com for a sale price of £186.79. There are discounts available for 2 Fulcrum Red Metal 3, with the largest reduction being 10% off the Fulcrum RM3-11DRBH12 Red Metal 3 HH12 135/142 6-Bolt Disc rear wheel 2011. This is available from Cyclestore at a price of £211.49, saving £23.50. and the top percentage discount is also for this model at Cyclestore.